Mark Buehrle threw the 18th perfect game in MLB history on July 23, 2009 against the Tampa Bay Rays. The franchise based in Chicago, Illinois. They play in the American League Central division. Pitchers for the White Sox have thrown 18 no-hitters in franchise history. A no-hitter is officially recognized by Major League Baseball only "when a pitcher (or pitchers) allows no hits during the entire course of a game, which consists of at least nine innings. In a no-hit game, a batter may reach base via a walk, an error, a hit by pitch, a passed ball or wild pitch on strike three, or catcher's interference." No-hitters of less than nine complete innings were previously recognized by the league as official; however, several rule alterations in 1991 changed the rule to its current form. A no-hitter is rare enough that only one team in Major League Baseball has never had a pitcher accomplish the feat. [a] Three perfect games, a special subcategory of no-hitter, have been pitched in White Sox history. As defined by Major League Baseball, "in a perfect game, no batter reaches any base during the course of the game." These feats were achieved by Charlie Robertson in 1922, which was the first perfect game on the road in MLB history, Mark Buehrle in 2009, and Philip Humber in 2012. Nixey Callahan threw the first no-hitter in White Sox history on September 20, 1902; the most recent no-hitter was thrown by Philip Humber on April 21, 2012. Only two left-handed pitchers have threw no-hitters in franchise and three of the four most recent no-hitters: Wilson Alvarez (in 1991) and Buehrle (in 2007 and 2009). The other 16 pitchers were right-handed. Two pitchers have thrown more than one no-hitter in a White Sox uniform, including a hall of famer Ed Walsh and Buehrle. Ten no-hitters were thrown at home and eight on the road. They threw four in April, one in May, one in June, two in July, five in August, and five in September. The longest interval between no-hitters was between the games pitched by Bill Dietrich and Bob Keegan, encompassing 20 years, 2 months, and 19 days from June 1, 1937 till August 20, 1957. Conversely, the shortest interval between no-hitters was between the games pitched by Vern Kennedy and Dietrich, encompassing merely 1 year, 9 months and 1 day from August 31, 1935 till June 1, 1937. They no-hit the Detroit Tigers the most, which occurred four times, which were defeated by Callahan in 1902, Smith in 1905, Robertson in 1920, and Joel Horlen in 1967. There are three no-hitters which the team allowed at least a run, ones by Joe Benz, a combined no-hitter by Blue Moon Odom and Francisco Barrios, and Joe Cowley. The most baserunners allowed in a White Sox no-hitter was a combined no-hitter by Odom and Barrios (in 1976), who allowed 12. Of the 18 no-hitters, four have been won by a score of 6–0, more common than any other results. The largest margin of victory in a White Sox no-hitter was a 15–0 win by Frank Smith in 1905. The smallest margin of victory was a 1–0 wins by Smith in 1908 and by Odom and Barrios who combined to throw a no-hitter in a 2–1 victory in 1976. The umpire is also an integral part of any no-hitter. The task of the umpire in a baseball game is to make any decision "which involves judgment, such as, but not limited to, whether a batted ball is fair or foul, whether a pitch is a strike or a ball, or whether a runner is safe or out… [the umpire's judgment on such matters] is final." Part of the duties of the umpire making calls at home plate includes defining the strike zone, which "is defined as that area over homeplate (sic) the upper limit of which is a horizontal line at the midpoint between the top of the shoulders and the top of the uniform pants, and the lower level is a line at the hollow beneath the kneecap." These calls define every baseball game and are therefore integral to the completion of any no-hitter. 14 different umpires, such as Eric Cooper, presided over each of the White Sox' 18 no-hitters. Cooper umpired both Buehrle's no-hitters. The manager is another integral part of any no-hitter. The tasks of the manager include determining the starting rotation as well as the batting order and defensive lineup every game. 14 different managers, such as Ozzie Guillén, have led the team during the White Sox's 18 no-hitters. "Chicago White Sox on Baseball Almanac". Baseball Almanac. Retrieved November 24, 2010. ^ "Chicago White Sox Franchise History". ESPN. Retrieved September 19, 2010. ^ a b "MLB Miscellany: Rules, regulations and statistics". MLB.com. Major League Baseball. Retrieved September 19, 2010. ^ Kurkjian, Tim (June 29, 2008). "No-hit win makes no sense, except in baseball". ESPN. Retrieved September 19, 2010. ^ a b c "Philip Humber throws 21st perfect game in MLB history". Retrieved January 8, 2013. ^ a b "Umpires: Rules of Interest". MLB.com. Major League Baseball. Retrieved September 19, 2010. ^ Bronson, Eric. Baseball and Philosophy: Thinking Outside the Batter's Box, Pgs 98–99. ^ "1902 White Sox season schedule, box scores, and splits". Baseball-Reference.com. Sports Reference LLC. Retrieved September 19, 2010. ^ "1905 White Sox season schedule, box scores, and splits". Baseball-Reference.com. Sports Reference LLC. Retrieved September 19, 2010. ^ "1908 White Sox season schedule, box scores, and splits". Baseball-Reference.com. Sports Reference LLC. Retrieved September 19, 2010. ^ "1911 White Sox season schedule, box scores, and splits". Baseball-Reference.com. Sports Reference LLC. Retrieved September 19, 2010. ^ "1914 White Sox season schedule, box scores, and splits". Baseball-Reference.com. Sports Reference LLC. Retrieved September 19, 2010. ^ "1917 White Sox season schedule, box scores, and splits". Baseball-Reference.com. Sports Reference LLC. Retrieved September 19, 2010. ^ "April 30, 1922 Chicago White Sox at Detroit Tigers Box Score and Play by Play". Baseball-Reference.com. Sports Reference LLC. Retrieved September 19, 2010. ^ "August 21, 1926 Chicago White Sox at Boston Red Sox Box Score and Play by Play". Baseball-Reference.com. Sports Reference LLC. Retrieved September 19, 2010. ^ "August 31, 1935 Cleveland Indians at Chicago White Sox Box Score and Play by Play". Baseball-Reference.com. Sports Reference LLC. Retrieved September 19, 2010. ^ "June 1, 1937 St. Louis Browns at Chicago White Sox Box Score and Play by Play". Baseball-Reference.com. Sports Reference LLC. Retrieved September 19, 2010. ^ "August 20, 1957 Washington Senators at Chicago White Sox Box Score and Play by Play". Baseball-Reference.com. Sports Reference LLC. Retrieved September 19, 2010. ^ "September 10, 1967 Detroit Tigers at Chicago White Sox Box Score and Play by Play". Baseball-Reference.com. Sports Reference LLC. Retrieved September 19, 2010. ^ "July 28, 1976 Chicago White Sox at Oakland Athletics Box Score and Play by Play". Baseball-Reference.com. Sports Reference LLC. Retrieved September 19, 2010. ^ "September 19, 1986 Chicago White Sox at California Angels Box Score and Play by Play". Baseball-Reference.com. Sports Reference LLC. Retrieved September 19, 2010. ^ "August 11, 1991 Chicago White Sox at Baltimore Orioles Box Score and Play by Play". Baseball-Reference.com. Sports Reference LLC. Retrieved September 19, 2010. ^ "April 18, 2007 Texas Rangers at Chicago White Sox Box Score and Play by Play". Baseball-Reference.com. Sports Reference LLC. Retrieved September 19, 2010. 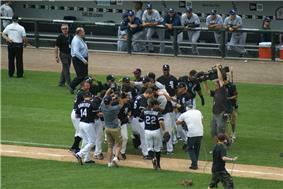 ^ "July 23, 2009 Tampa Bay Rays at Chicago White Sox Box Score and Play by Play". Baseball-Reference.com. Sports Reference LLC. Retrieved September 19, 2010. ^ "April 21, 2012 Chicago White Sox at Seattle Mariners Box Score and Play by Play". Baseball-Reference.com. Sports Reference LLC. Retrieved April 22, 2012. ^ "No Hitters Chronologically". Retrosheet.org. Retrosheet, Inc. Retrieved September 19, 2010.